Ever have a child who is too indecisive about what toy to play with or activity to do? Chalktrail allows a child to do two fun things at once. ARTIVITY is how to describe this unique combination of outdoor activity and artistic creativity. 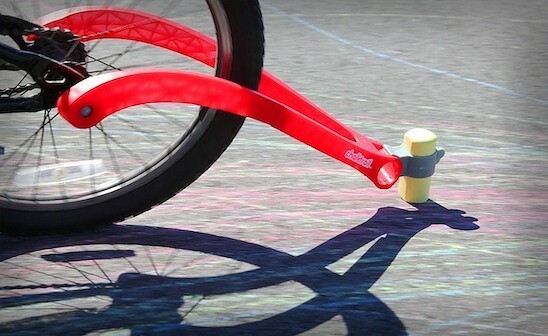 With Chalktrail, a child can enjoy the timeless joy of riding a bike or scooter together with the creative expression of decorating the neighborhood streets and sidewalks with bright and colorful chalk. In designing Chalktrail, the creators at Fat Brain Toy Co. were looking for a way to make the toy independently manageable for a child without having to go inside and ask a parent for help every few minutes. The simplistic play pattern of Chalktrail is expressive and fresh so that children can work the toy independently and let their creativity and energy soar. The nostalgic amusement of playing outside has returned with no bright lights, flashing screens, batteries, cords or Internet connections. Just kids, wheels, chalk, fresh air and fun. 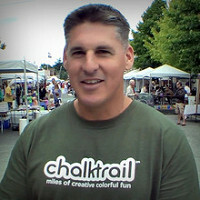 Chalktrail combines two of the greatest outdoor activities into one; bike or scooter riding and chalk drawing. With an uncomplicated play pattern, a child can ride through the neighborhood and leave a colorful and creative trail behind. Ever have a child who is too indecisive about what toy to play with or activity to do? Chalktrail allows a child to do two fun things at once. ARTIVITY is how to describe this unique combination of outdoor activity and artistic creativity. With Chalktrail, a child can enjoy the timeless joy of riding a bike or scooter together with the creative expression of decorating the neighborhood streets and sidewalks with bright and colorful chalk. In designing Chalktrail, the creators at Fat Brain Toy Co. were looking for a way to make the toy independently manageable for a child without having to go inside and ask a parent for help every few minutes. The simplistic play pattern of Chalktrail is expressive and fresh so that children can work the toy independently and let their creativity and energy soar. The nostalgic amusement of playing outside has returned with no bright lights, flashing screens, batteries, cords or Internet connections. Just kids, wheels, chalk, fresh air and fun.